There is still much debate over the mechanisms of signal transduction following integrin-ligand binding, however recent studies reveal that irrespective of the global density of integrins, local clustering of ligand-bound integrins is paramount to efficient signal transduction . The minimum cluster area required for stable FA assembly and force transmission has a dynamic nanolimit, regulated by the interplay between adhesive force, cytoskeletal tension and the structural linkage that transmits them . These initial clusters (specifically αVβ3 integrins) serves as a platform for the tethering and polymerization of actin filaments . Adapted from . Initial integrin clusters (top left), after activation by talin binding, provide avenue for initial actin polymerization (top middle) by recruiting focal adhesion components- FAK, SFKs and paxillin. New actin filaments tether to talin, the clusters get pushed away and then pulled closer by myosin contractions (top right). This causes cycles of transient talin stretching and vinculin binding until the talin- actin bond stabilizes. Upon stable vinculin binding (bottom), further integrin clustering and signaling promote Rac1 activation. Rac1, in turn, further activates actin polymerization modules, Arp2/3 and formins. From available data, the following course of events is hypothesized to be the working model for FA initiation (reviewed in , see figure below). 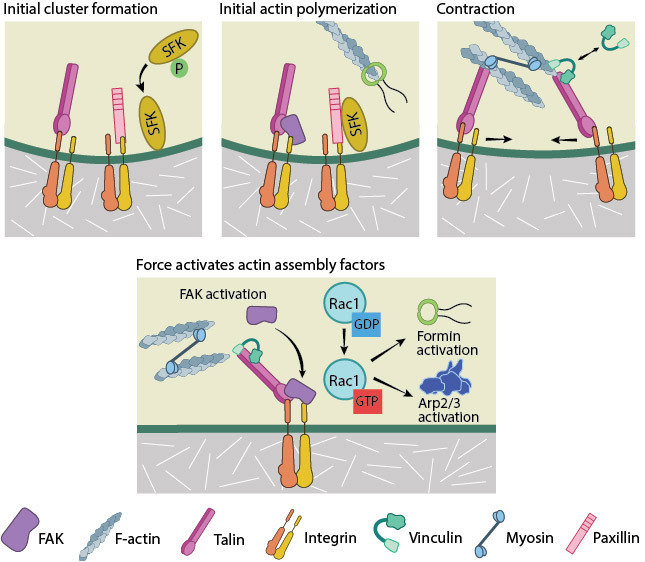 Actin–talin–integrin complexes stabilize both focal adhesions and stress fibers through the recruitment of additional components such as focal adhesion kinase (FAK) , paxillin  and Src-family kinases (SFKs) to integrin tails . The phosphatase, RPTP-α, is known to activate SFKs and in doing so reinforce αVβ3-cytoskeletal connections . While talin can further enhance PIP2 production and FAK activation , FAK has been shown to reinforce clusters by promoting talin recruitment . Src-dependent actin polymerization initially pushes the clusters outwards. Subsequently, myosin II contraction brings adjacent actin-linked clusters closer to one another and inwards . Actomyosin contractility has also been shown to stretch talin , revealing binding sites for other proteins, such as vinculin . This has been shown to occur in living cells, with an integrin-talin-vinculin-actin link being established in a stretch-dependent manner. Here, stretching of the cell substrate resulted in vinculin accumulation at the focal adhesion site. This link was sufficient to arrest the retrograde flow of actin filaments, and promote the formation of cellular protrusions . Thus it is believed that cycles of talin deformation, vinculin binding and release by the slipping actin filaments  integrate the traction exerted on the substrate to biochemical signals . Once the talin-actin bond stabilizes, the talin-bound vinculin augments actin coupling through its tail  and promotes allosteric integrin clustering via signal transduction molecules such as Rap1 GTPase (reviewed in ). Actin polymerization is also believed to precede adhesion formation, for example through the direct interaction of vinculin with components of the actin polymerization module such as VASP  and Arp2/3 in a PI3K and Rac dependent manner . Although the mechanism of filament nucleation at adhesions is elusive, several Rac1 targets are implicated (reviewed in ). Additionally, the link between the actin cytoskeleton and integrins can also be further stabilized by the recruitment of the IPP cytosolic ternary complex , comprising integrin-linked kinase (ILK), parvin and PINCH (particularly interesting Cys-His-rich protein). Integrin-related kinase (ILK)  is able to bind to the separated tails of activated β1 and β3 integrins . The IPP complex is recruited to focal adhesions to promote cytoskeleton linkage and integrin signaling  through several binding partners including paxillin and kindlin (reviewed in ). How are focal adhesion dynamics regulated? 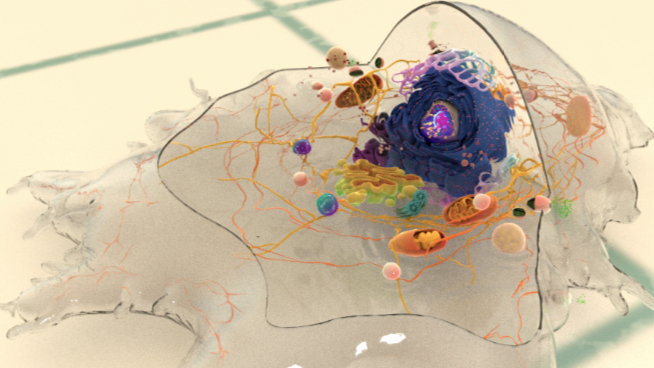 How are proteins recruited to focal adhesion sites? How do focal adhesions disassemble? How do focal adhesions mature? What is the first step in focal adhesion assembly? What is the role of Rho GTPases in the regulation of focal adhesion assembly? What processes drive focal adhesion growth? What steps are involved in the formation of focal adhesions?